Published: Jan. 14, 2016 at 08:30 p.m. Updated: Jan. 15, 2016 at 10:27 a.m.
Two of the AFC's best teams over the last decade are ready to meet again for the third time in the postseason in the Ben Roethlisberger era. But the questions surrounding the two future Hall of Fame quarterbacks in this game gives the matchup a strange feel. Peyton Manning has only played one half of football since Week 10 because of a foot injury and a subsequent benching that wasn't called a benching. Big Ben, meanwhile, has torn ligaments in his throwing shoulder in addition to a sprained AC joint. He nearly watched the Steelers' season end from the bench last week when Landry Jones was picked off with under two minutes left against Cincinnati. But Jeremy Hill's fumble gave the Steelers a second life, and Roethlisberger helped save the day off the bench. The Steelers, who beat Brock Osweiler and the Broncos in Pittsburgh in Week 15, boast one of the best offenses in the league. It's a fantastic matchup as they face a Broncos defense that led the league in yards allowed, sacks and yards-per-play allowed. Pittsburgh's strong offensive line have to hold off the dynamic pass rush duo of Von Miller and DeMarcus Ware. The X's and O's are intriguing, but the return of Manning to the lineup puts this game over the top. This could be Manning's 10th career playoff one-and-done, except this time he could be done forever. Then again, perhaps one of the greatest players in league history could begin a fairy tale march to the Super Bowl just when everyone least expected it. Peyton Manning's rough track record in cold weather and in the Divisional Round is well documented -- and documented below in our mind-blowing stats. We're not too concerned as much with Manning's previous seasons as we are with this one. He made poor decisions throughout the regular season in addition to his diminished arm strength. By all accounts, he has looked sharper in practice after getting time to heal. But he does not have a lot of game experience in Gary Kubiak's offense and this is still a team built around defense and running. The matchup is tougher than people realize. The Steelers are playing more consistently on defense; they have held five of their last six opponents under 20 points. (Denver was the only exception.) There are fewer breakdowns in the secondary and Denver's offensive line had a huge problem blocking defensive end Cameron Heyward in the first meeting. Linebacker Ryan Shazier is a game-wrecker and is coming off the most complete performance of his season. He has a real chance to out-shine Von Miller in this game and Denver's offensive line has vulnerabilities. James Harrison is also improbably still playing at a high level. Manning got the starting job back in part because of his quick decision making. He can pick the mismatches out quickly and knows he can't hold the ball long. Broncos receiver Emmanuel Sanders had his way with William Gay in the team's first matchup. Demaryius Thomas, who has had a rocky season, will try to recapture the playoff magic he had with Tim Tebow against the Steelers back in the 2012 season. Unfortunately, we won't see one of the most anticipated matchups of the weekend since Brown has been ruled out with a concussion. But that's the point. With Brown not on the field, the advantage seriously tilts towards Denver. Chris Harris had the worst day of his excellent career against Brown in Week 15, giving up 13 catches, 147 yards and two touchdowns. Many of those completions took absolutely perfect passes from Roethlisberger and improbable grabs by Brown. Pittsburgh has been more conservative and less effective on offense the last three games. Roethlisberger was not throwing the ball deep against Cincinnati even before he injured his shoulder. The run game is not the problem here; Fitzgerald Toussaint and Jordan Todman did a surprisingly good job in place of injured DeAngelo Williams. But a diminished Roethlisberger might only be able to throw the ball short. That limits the entire offense. He's the best in the league at vertical passes and throwing first downs on out routes to the opposite hash. Roethlisberger knows he can't hold the ball too long because Denver's pass rush depth is excellent. Shaq Barrett and Shane Raye could be the best No. 3 and No. 4 pass rushers in the league. Brown and Denver's Demaryius Thomas lead the NFL in receiving yards since 2012. ... The Broncos are used to winning tight games. They have won nine games by seven points or fewer. Only the 1978 Oilers (10 wins) have won more such games in NFL history. ... Manning is 2-5 in his career in Divisional Round games following a bye. He has lost his first playoff game in nine of 14 seasons in the league. ... Since 2005, No. 6 seeds are 5-5 against No. 1 seeds. The Steelers made the Super Bowl as the No. 6 seed in 2005. ... If the Broncos defense makes a big play, they are nearly impossible to beat. They were 11-1 with one takeaway, and 1-3 when they didn't have a turnover. ... The Steelers defense was better down the stretch. They have only given up more than 20 points once in the last six games. The logic all points to Denver in this matchup. 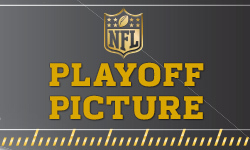 But the playoffs don't often play out logically and every Divisional Round needs a big upset. We can't shake the feeling that Pittsburgh's defense is peaking at the right time and the Steelers have the advantage at quarterback, even if Roethlisberger is not fully healthy.